"I absolutely love Dr. Asnani! She truly loves kids and is so sweet with my daughter!" 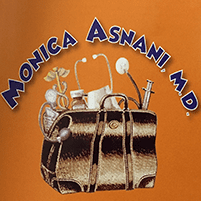 "Dr. Asnani is everything you would want in a pediatrician, and we love and respect her." "The feedback, knowledge and insight that Dr. Asnani provides to us is invaluable." Same great doctors, now with a new name! The doctors at Miracle Mile Pediatrics are skilled, caring pediatricians providing the highest quality care for children in and around the Miracle Mile neighborhood of Los Angeles, CA. Miracle Mile Pediatrics offers patients an array of routine, preventive and “sick care” options, including annual pediatric checkups, sports physicals, developmental screening and vaccines, as well as treatment for asthma and allergies and obesity consultation to help overweight children lose weight and lead healthier lives. Miracle Mile Pediatrics also offers medical ear piercing for children of all ages, and provides after hours care for the convenience of both working parents and school-age children. We are pleased to announce our affiliation with the CHLA Health Network- a premier network of pediatric providers. Dr. Asnani was named one of Los Angeles Magazine's Top Doctors of 2019! !